It was the day the war of movement on the Western Front stopped. Afterward there would be no big breakthroughs until 1918, and forty-one months of trench warfare would ensue. 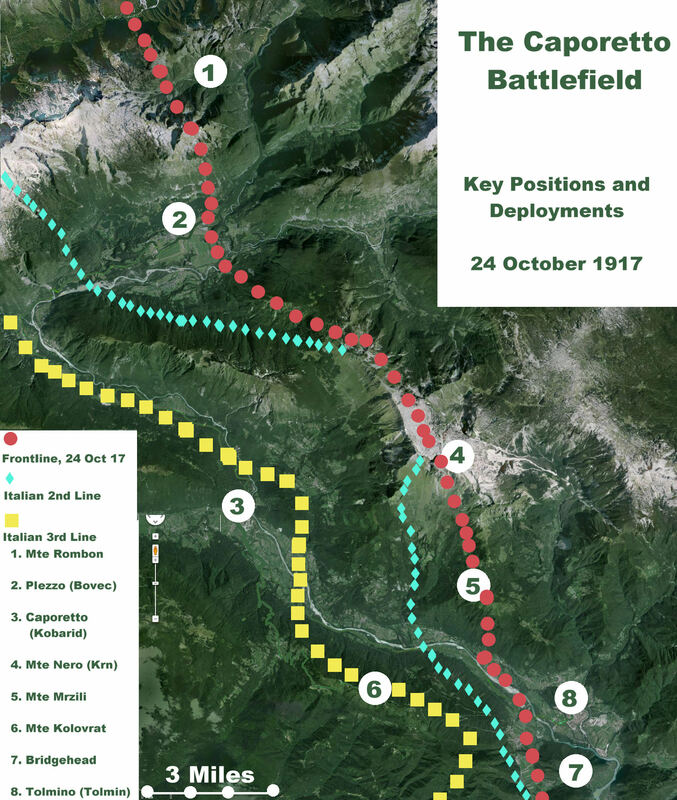 By mid-day on 31 October 1914 there were no more flanks, just one last gap in the entire line from the Swiss border to the English Channel where a breakthrough seemed possible. 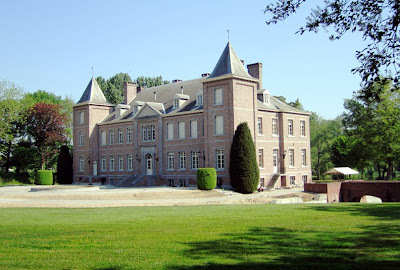 It was at a place five miles east of Ypres on the grounds of Gheluvelt Chateau, just north of the Menin Road. 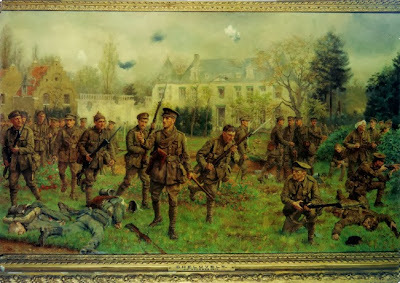 Shortly before noon the line of the British 1st Division was broken at Gheluvelt. If at that moment German reinforcements available close at hand could thrust through the gap and spread out fanwise, they could have rolled up the defenders on either flank in their rear and simply broken the cohesion of the British in Flanders to pieces. The impulse of retreat began to seize the British troops. Already men and guns were streaming back towards Ypres. The Germans quickly assembled thirteen battalions for a final follow-through attack. General Charles FitzClarence commanding the British Army 1st Brigade, was nearby and saw the declining situation. 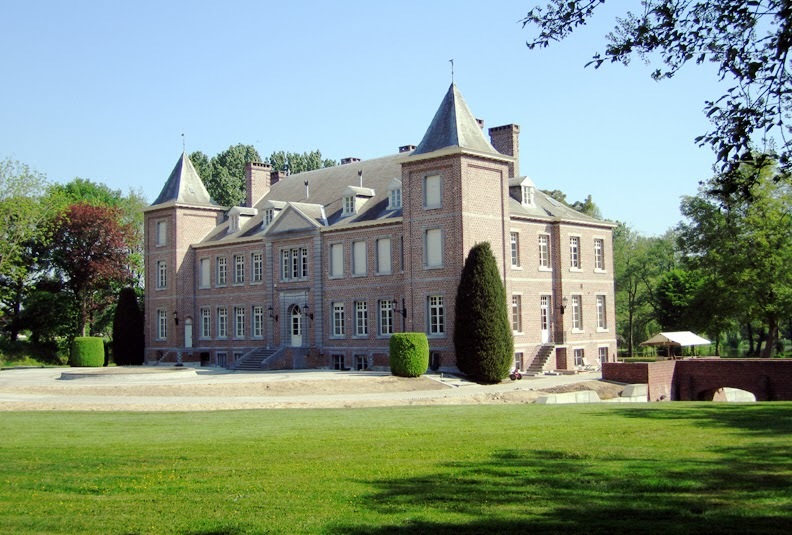 At Polygon Wood north of Gheluvelt, he got hold of the 2nd Worcestershires, part of the reserve of the 2nd Division on the north, and ordered them to counterattack immediately. 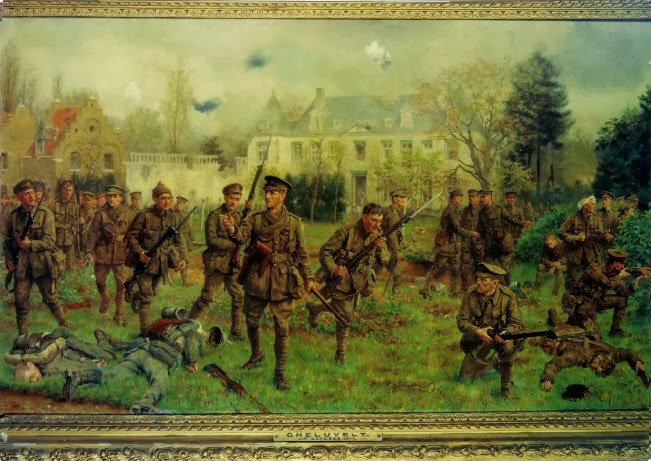 This movement had scarcely begun when a shell burst in Hooge Chateau, where the staff of both divisions had assembled for a conference, and practically destroyed them. But the Worcestershires — a tiny force of eight officers and 360 men — swept all before them nonetheless. They fell upon their adversaries, who were mostly Bavarians, and drove them back in confusion from the chateau grounds. The line was reestablished. The Western Front of the Great War was effectively completed. It would not move dramatically until the first Ludendorff Offensive of 1918. General FitzClarence, sadly, did not have much longer to live. 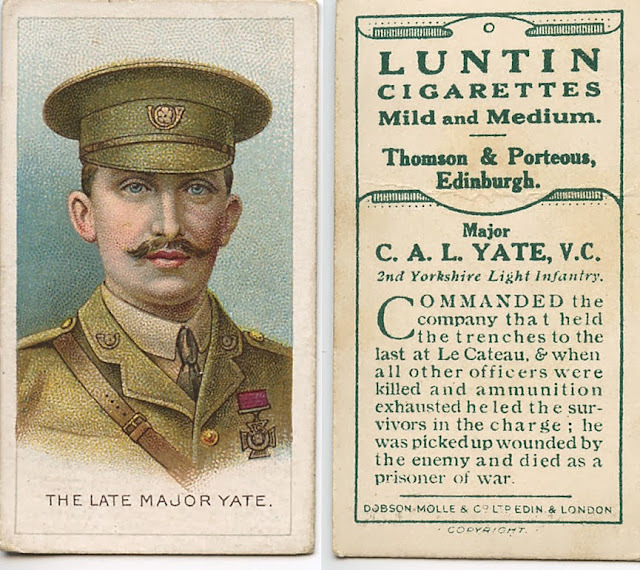 He died on 11 November 1914 in fighting along the Menin Road, where many more would fall in the remaining four years of war. Twenty-eight years ago this month, Walter MacKay Draycot – rifleman, topographer, photographer and (unpublished) memoir writer – died in North Vancouver, Canada, at the age of 102. 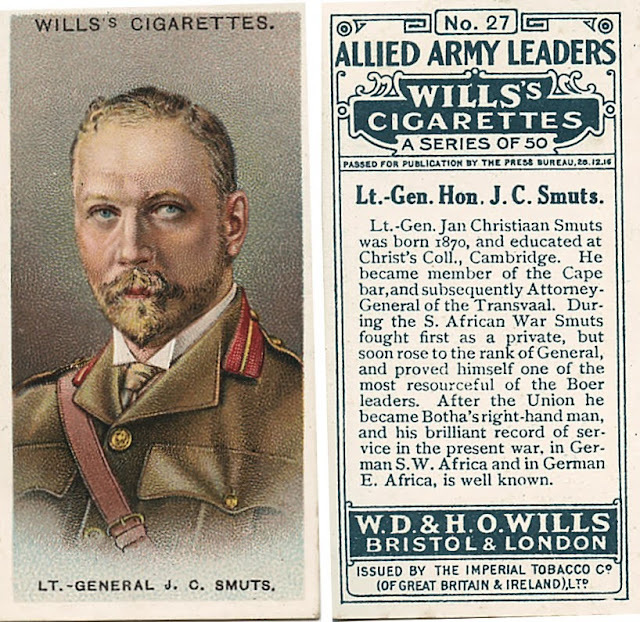 Born in 1885 in Leicestershire, England, Draycot served in the Boer War as a member of the 60th Rifles and Engineers. He emigrated to Canada in 1907, was employed for a few months by the Canadian Pacific Railway as a railroad worker, set up business as a farmer/merchant in Ontario in 1910, and in 1911 he settled in Lynn Valley on the west coast of Canada. 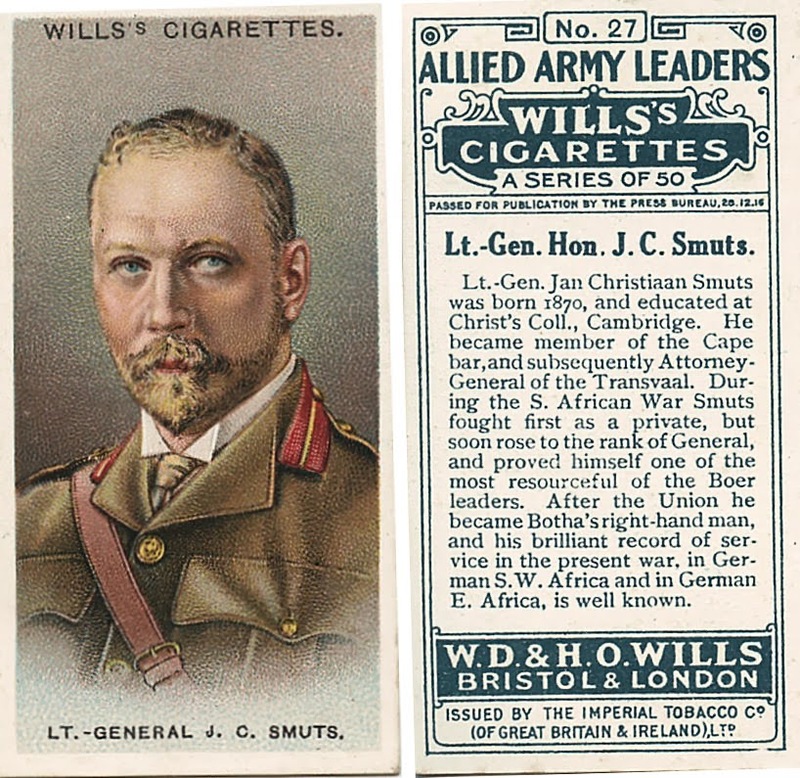 On the outbreak of the 1914–18 War he was back again in England with his old regiment. While waiting to be Commissioned as an officer he was claimed by Colonel Farquar of the Famous Princess Patricia’s on the grounds he was a Canadian Citizen. His exploits have been written in an unpublished typed book. 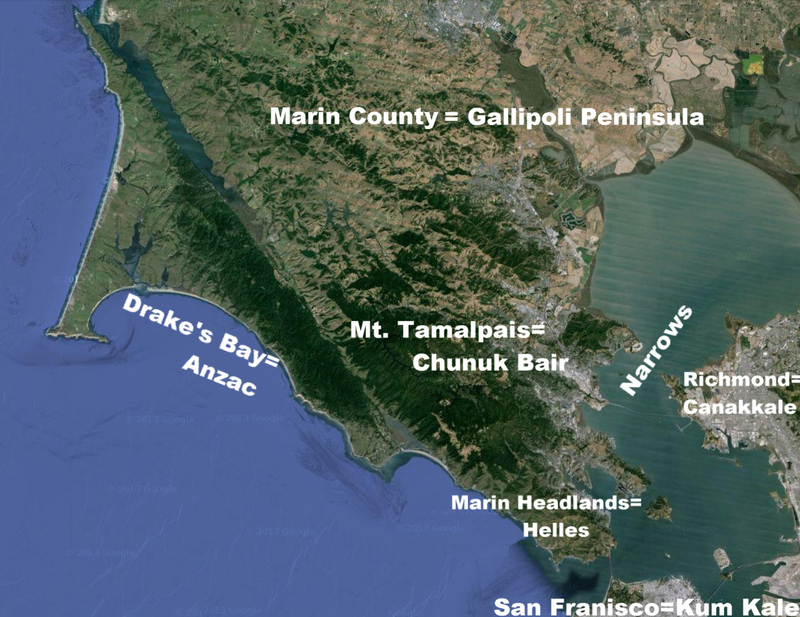 Appointed Military Topographer. Being the only exponent of that art in the Brigade of 4,000 men, he was sought by General Macdonnel for service in the 7th Canadian Infantry Brigade. 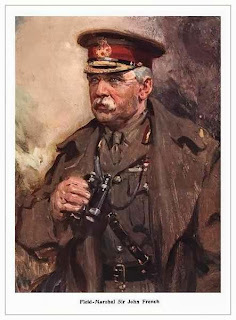 Both the Division and Corps wanted his services, but Macdonnel retained him. Appointed the only Official Sketcher in the Canadian Army with credentials. Thrice wounded. Arrested several times as a spy, when sketching. 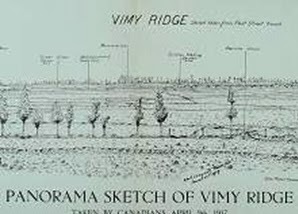 Twice ‘gassed’; the last dose sent him to England where, after recovering, he conducted a school to teach officers the art of Military Sketching and Topography. After the War, some of his sketches were printed – see his book; it tells all. 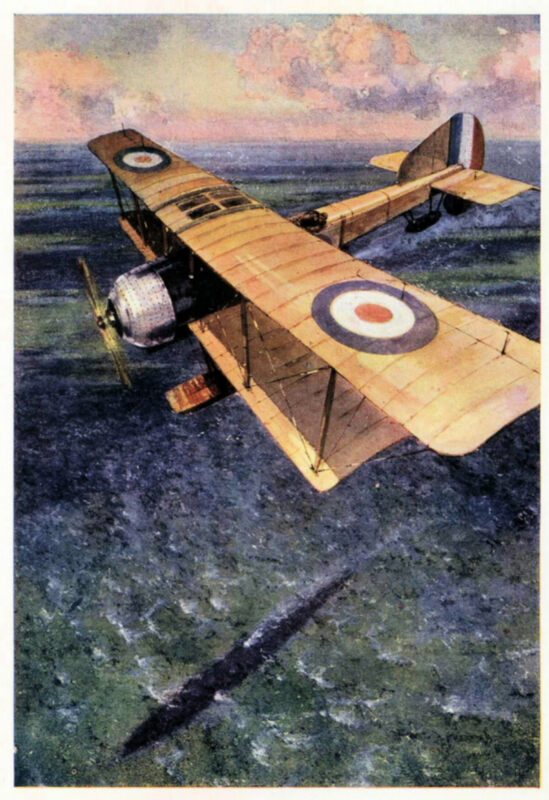 Draycot fought at Ypres, the Somme, and Vimy Ridge. Vimy was his final battle. After being gassed, he was shipped to England for convalescence. A small brook flowed through Sanctuary Wood. Any activity in this area could be seen by the observer in the Bird Cage. However, it was necessary to obtain information during daylight. Forgetful, as we all become when engrossed in a subject, my mind being on my work led me forward scanning here and there taking notes and measurements. Something compelled me to turn round. Horrors of Horrors! There was the Bird Cage – in full view! Stupefied, my blood froze at the sight. He could see me! My position was likened to an oasis in the desert . Draycot’s war career was tinged with bitterness; enlisting as a private but doing the work of a trained topographer (he learned this from Baden Powell) and acting intelligence officer, he never forgave the army for its refusal to honour his temporary promotion to sergeant in 1916. The reason given was that Draycot could not be promoted permanently because, during much of the war, he was on temporary loan to other regiments as a topographer. Private he was – and private he would remain. On returning to Lynn Valley after his convalescence, Draycot worked for the local community, as justice of the peace (from 1923 to 1975) and as a Scout leader. One year after his death on 21 October 1985, a statue was erected in Lynn Valley in his honour. Peacetime finally gave him the recognition that he was unable to gain in time of war. Deathwatch: Religious Allegory or Great War Zombie Film – Or Both? This film brought to mind two lines from the last poem Isaac Rosenberg wrote before he was killed in action. 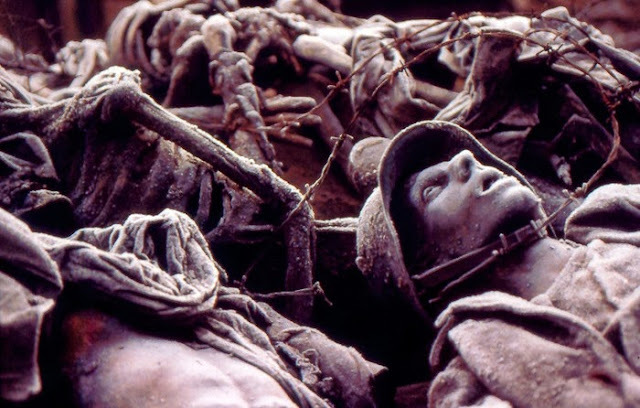 The poem, “Through These Pale Cold Days,” describes suffering soldiers and states how "They see with living eyes/How long they have been dead." This is about as close to a spoiler as I want to go in discussing this horror film based on WWI. The surface plot is easily described. A group of British soldiers go over the top at night into the face of intense machine gun fire and exploding shells. 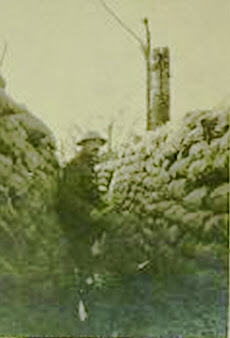 Several standard trench warfare motifs are provided: the fear before the attack, the youngest soldier panicking and refusing to go over until threatened at gunpoint by an officer and helped by a sympathetic comrade, tangles of barbed wire to negotiate or get caught up in, mud containing bloated corpses, and the inevitable mowing down of men by the enemy’s furious fire power. It’s almost unbelievable that anyone could live through such a "stunt" but surprisingly the next scene shows a group of apparent survivors trudging over no man’s land in thick fog that they mistake for gas. When they discover it’s only fog and remove their masks, one soldier wonders what happened to the night — he can’t understand how it suddenly became light. Apart from the ominous and eerie background music we've heard from the beginning of the film, this is the first hint we get that all is not normal. Further hints will occur, however, such as a compass that no longer works, barbed wire that seems to have a life of its own, and blood that seeps from the mud in the German trench the survivors now occupy. All but one of the Germans in the trench are dispatched quickly enough, but not before it’s apparent that they are paralyzed with fear not of the British soldiers but of a nameless and invisible force that has already been decimating them. They try to warn the British about it but to no avail. 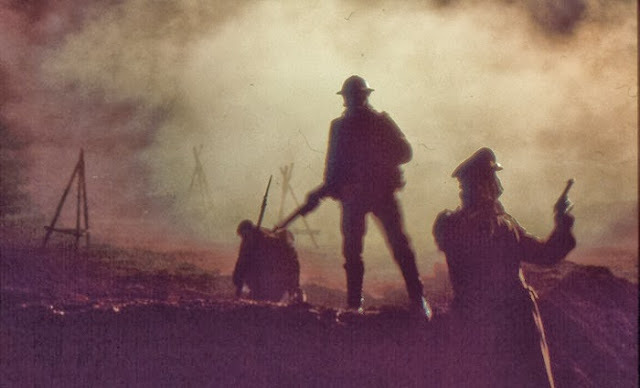 Gradually it overcomes all but the youngest and most innocent soldier, named Charlie Shakespeare, who in the end is able to leave the dark trench and walk out into the light — but not before he glimpses all his dead comrades sitting around a fire in a dark corner of the trench, seemingly alive. To arrive at an understanding of what director/writer Michael J. Bassett seems to have in mind in this film (and it’s admittedly open to interpretation) we have to absorb numerous oblique hints. Why, for example, is the subtitle of the film “Deliver them from evil”? Why the quick focus on a cross one of the soldiers is wearing? What is the significance of the Bible passage read over the pile of corpses? What are the ghostly voices that are heard at one point above the trench? 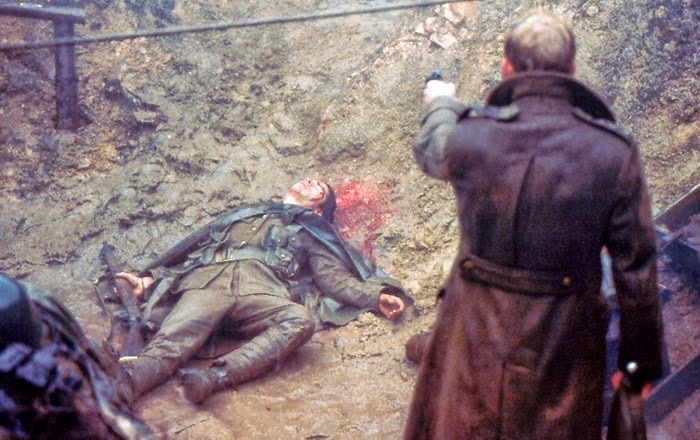 Why such comments by the soldiers as "There’s so many dead," "God isn't here," "We are still alive," "We’re dead, Charlie, I know that now," and Charlie Shakespeare’s exclamation as he leaves the trench after seeing all his dead comrades sitting around a fire — "I’m not dead!"? And what do we make of the German soldier at the very end waiting, with a knowing look in his eyes, for the next squad of British soldiers who are about to occupy the trench? Manpower was the big issue that shaped the campaign of 1918 and, ultimately, the end of the war before years' end. Consider this chart in which all the figures up through the Armistice are the actual numbers. 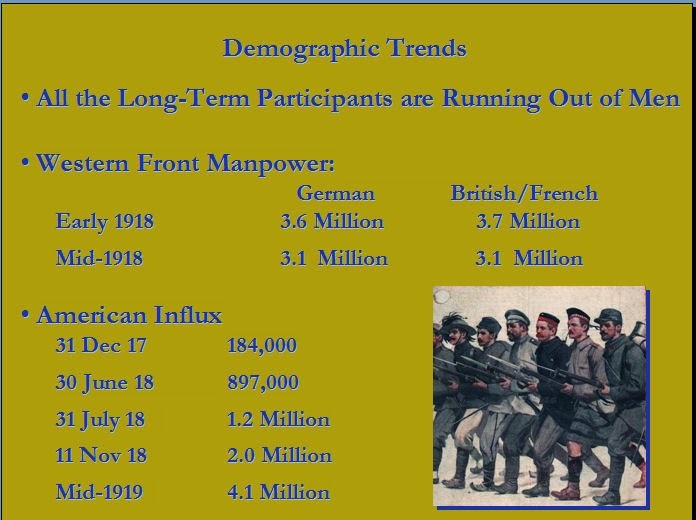 By late 1917 the war of attrition was working. All the countries in the war since 1914 were running out of bodies. The flood of American troops projected to arrive in 1918 and 1919 exercised a hypnotic power over both sides. The French were going to wait for the Americans, and late in the year event General Haig decided it would be imprudent to restart the Flanders offensive before the reinforcements arrived. 1. Use the troops available from Russia to dig in and wait for the Allies to attack them. This, they viewed as just postponing the inevitable. 2. Negotiate a settlement. This option meant they would have to give up most of the occupied territory in western Europe. The two Crown Princes who commanded armies, Wilhelm and Rupprecht, supported this, but the generals found it unpalatable to turn things over to the diplomats. 3. Go on the offensive and try to solve things before the Yanks arrived in force. This is the choice they made, and you know what ensued. 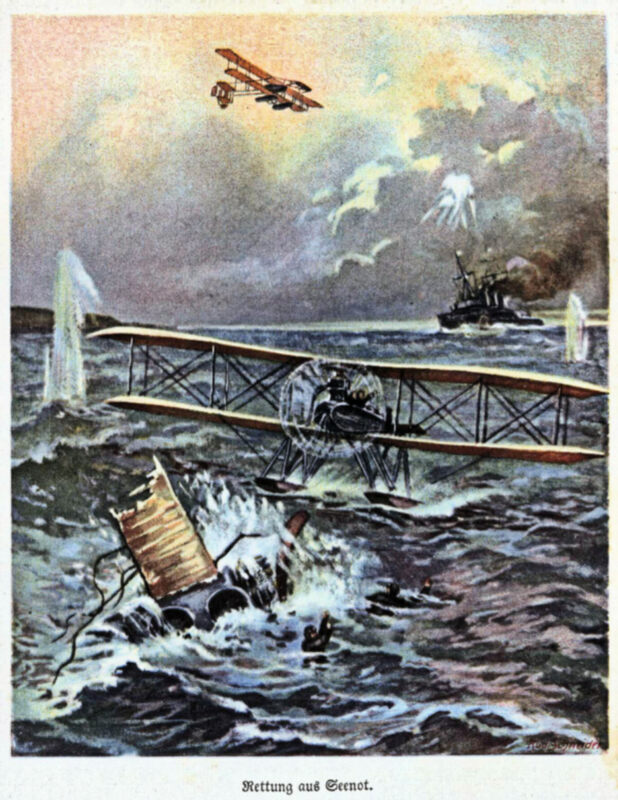 Among the different forms of warfare conducted between 1914 and 1918, one of the newest was the the combination of ships and aircraft. There were not a lot of photos that caught their interaction. Illustrators, however, were only constrained by their imagination. And, as you will see below, they were utterly captivated by the mixture of the planes, airships, and fleets of the combatants. Here are five selections from Tony Langley's collection. Even though, in fact, more men were killed by artillery fire than by bullets in the Great War, the war is remembered and is most strongly held in our collective memory as a machine gun war. The man who gave the world the machine gun was an American inventor named Hiram Maxim. Born in 1840 in Sangersville, Maine, Maxim was apprenticed at fourteen to a carriage maker. While learning that trade, he exhibited a knack for invention, designing a mousetrap that automatically reset and rid local mills of rodents. He obtained the first of his 271 patents at age twenty-six for a curling iron. By his thirties, Maxim was becoming chief engineer of the United States Electric Lighting Co. in New York, for which he introduced carbon filaments for electric light bulbs. At the 1881 Paris Exhibition, he demonstrated an electric pressure regulator and was awarded the Legion d'Honneur. 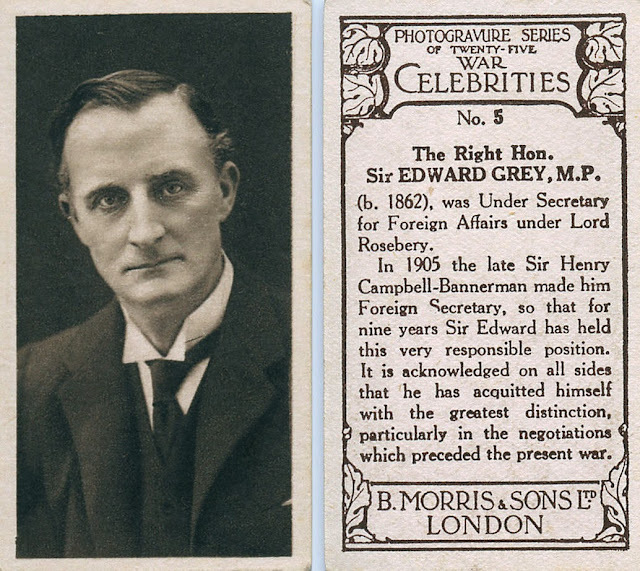 That same year he arrived in England to reorganize the London offices of the U.S. Electric Lighting Company. At the Paris Exhibition in 1881, a man told Maxim that if he wanted to make a fortune, he should invent a machine that would help these Europeans kill each other. Maxim did would go on to sell his machine guns to European countries on the eve of World War I, changing the nature of combat. 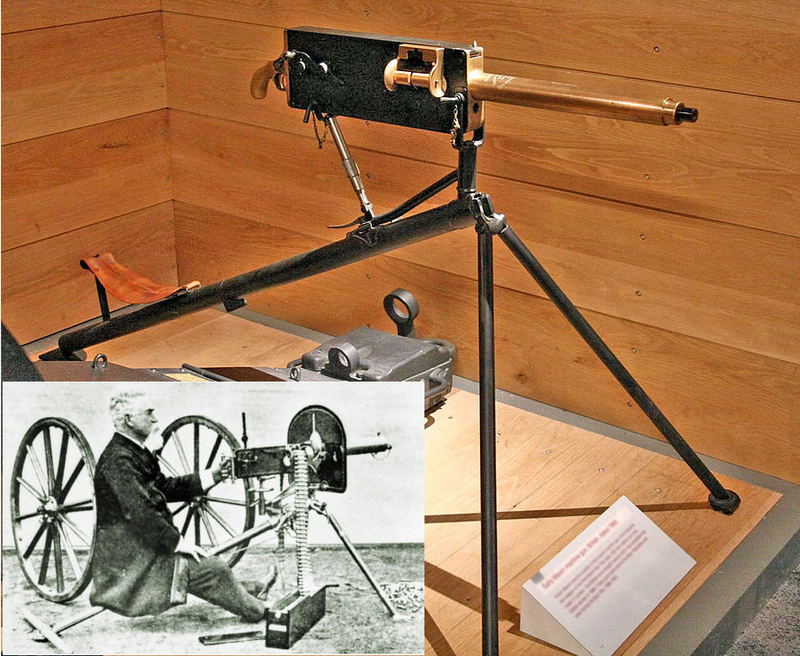 Maxim harnessed a bullet's recoil power to create a portable machine gun that needed only one barrel to fire all of its bullets automatically. In 1884, Hiram Maxim built the first effective machine gun, which revolutionized warfare. Its precursor, the Gatling gun, was a hand-driven, crank-operated gun with first six, later ten, barrels. Maxim's innovation was to harness the recoil power of each bullet, a force strong enough to eject the used cartridge and draw in the next one. Structured in this way, the portable gun needed only one barrel to fire all of its bullets automatically. To maximize the gun's effectiveness, Maxim also developed his own smokeless powder, cordite. In 1884, he founded the Maxim Gun Company in Britain to produce his new weapon. Five years later, he licensed it to the British Army in 1889; the following year the Austrian, German, Italian, Swiss, and Russian armies also incorporated it into their firearm auxiliary. In 1896, the Maxim Gun Company was bought out by Vickers, Ltd., of which Maxim became a director. 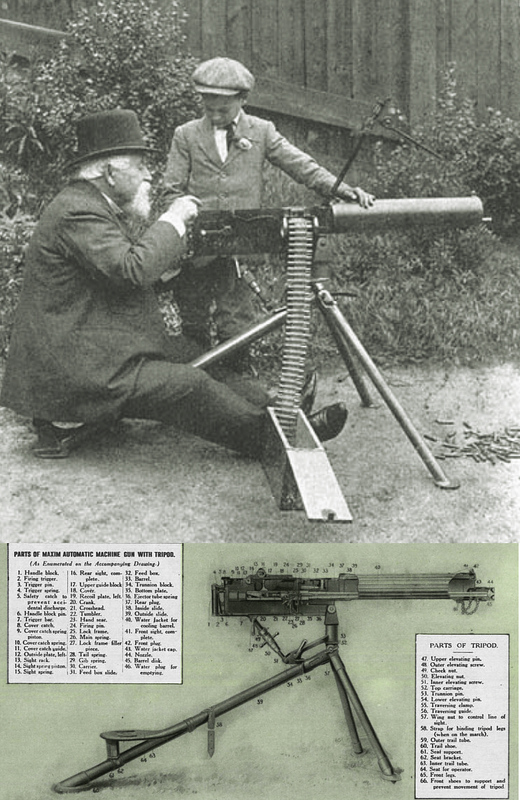 The Vickers machine gun would become standard issue of the British Army during World War I. Later in life Maxim turned his attention from warfare to flight, building a steam engine-powered airplane that briefly rose from the ground. While he was unable to achieve sustained flight, his amusement ride, the Captive Flying Machine, became a staple of British fairgrounds. Maxim died on 24 November 1916, as the Battle of the Somme, where over one million soldiers fell in four months of machine gun warfare, was winding down. Richard Sorge (1892-1944) was a disabled German war veteran, who became a communist and Soviet spy. He was ultimately hanged, but only after organizing the spy ring in Japan that gave Stalin the exact date of Operation Barbarossa and the Japanese plans to attack Pearl Harbor. 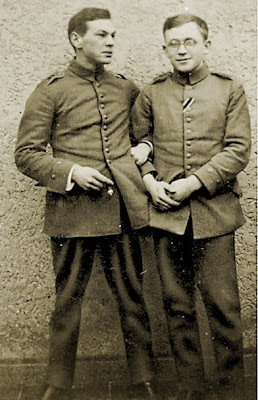 Sorge was an idealistic student in 1914 when the war broke out. 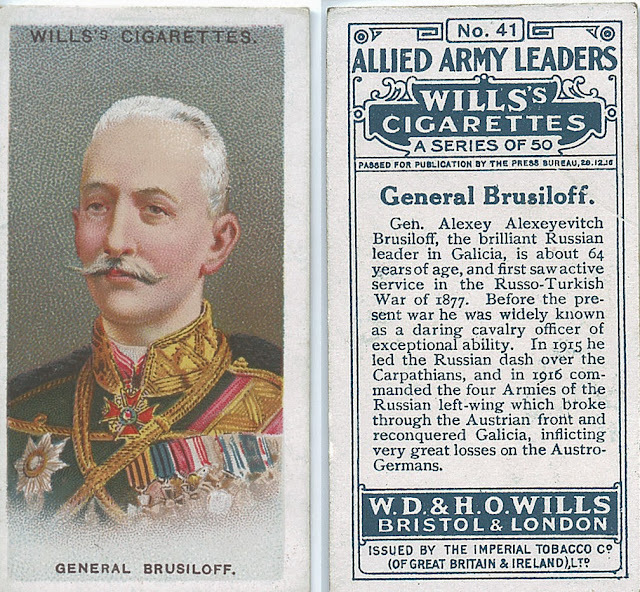 He volunteered for the German Army on 11 August 1914 and was assigned to the Third Guards Field Artillery Regiment. After minimal training, he was rushed into action and sent to the Yser sector in Flanders – a member of the tragic "Student Battalions." He saw his first fighting by November. Soon began his alienation and hatred of war. 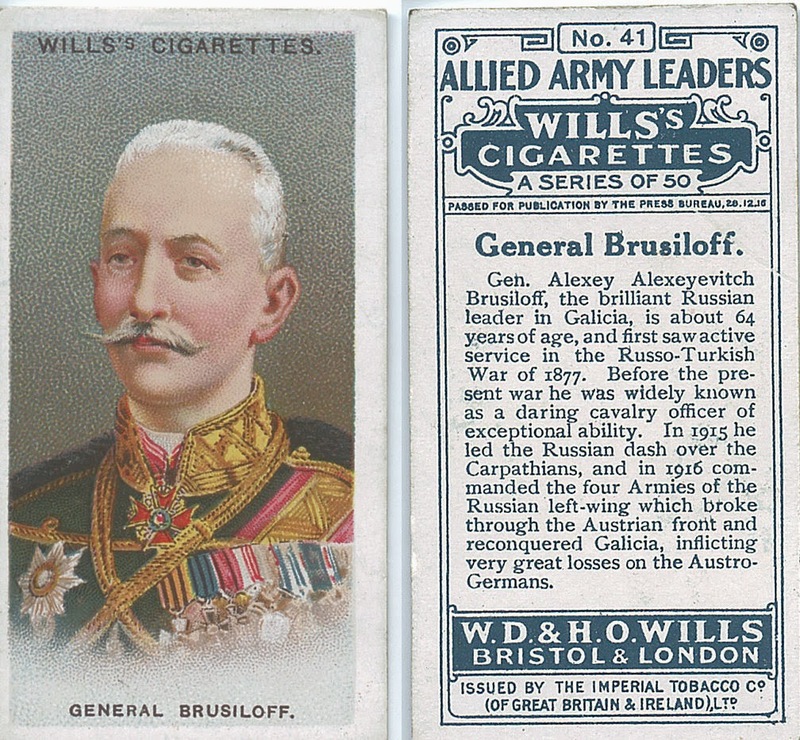 During the summer of 1915 he was wounded by Belgian counterbattery fire and was evacuated to Berlin. After convalescing, he was sent to the Eastern Front, where he was again wounded. After another cycle of hospital care and convalescence, he returned to action near Minsk and was wounded a third time, the most severe episode yet – shrapnel wounds almost costing him a leg. This would result in a fateful hospital stay near Koningsberg during which he met and had a romance with a nurse whose father was an ardent communist. He eventually left the hospital and the military with an Iron Cross, 2nd Class, a permanent limp, and a totally radicalized political ideology. He later wrote: "The World War from 1914 to 1918 exercised a profound influence upon my whole life. Had I been swayed by no other considerations, this war alone would have made me a Communist." To make this point, To Crown the Waves is a collection of studies of the world's major navies. Each of seven chapters examines the navy of the nations whose navies made a major contribution to the war. 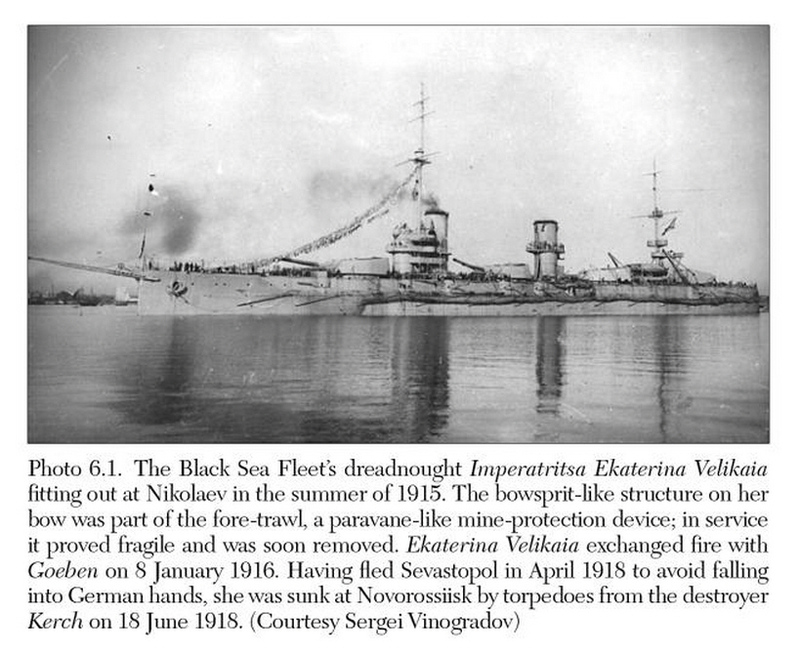 Great Britain, France, Russia, the United States, Italy, Germany, and the Austro-Hungarian Empire are each represented, with an eighth chapter for other nations whose navies participated in some way. Each chapter is written by an historian who specializes in a particular nation's naval history and who reads the language of the nation they are describing. The chapters then follow a common organizational format. 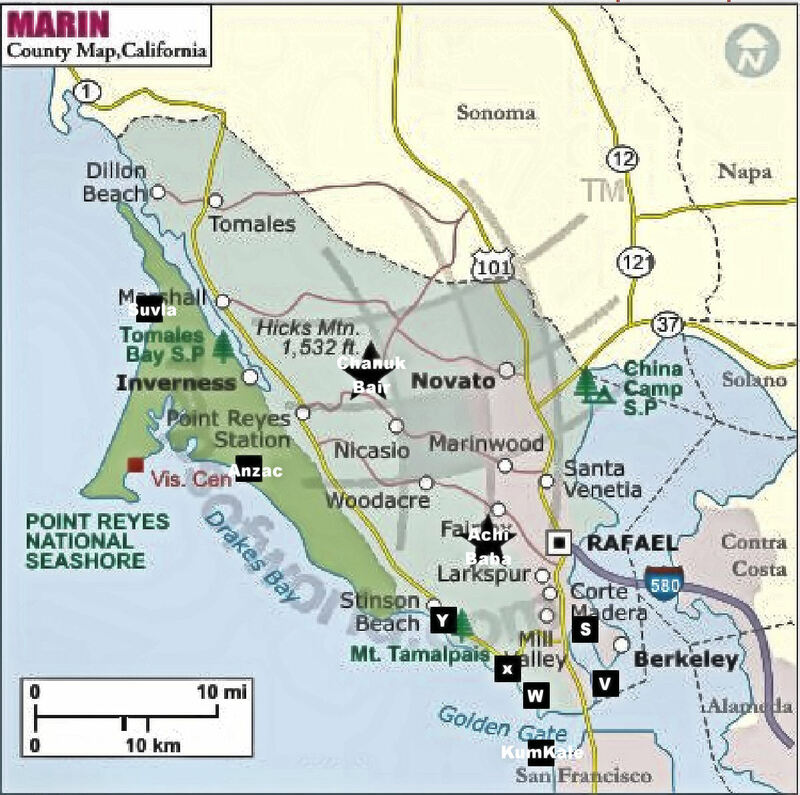 The advantage of this is that the reader can easily learn parallel information for each navy. Unfortunately, this makes the book more of a reference source than for reading cover to cover. That said, despite the potential problem multi-author works of widely varying writing quality can have, the editors of To Crown the Waves do a fine job of giving the entire book a common voice and thus utterly readable. 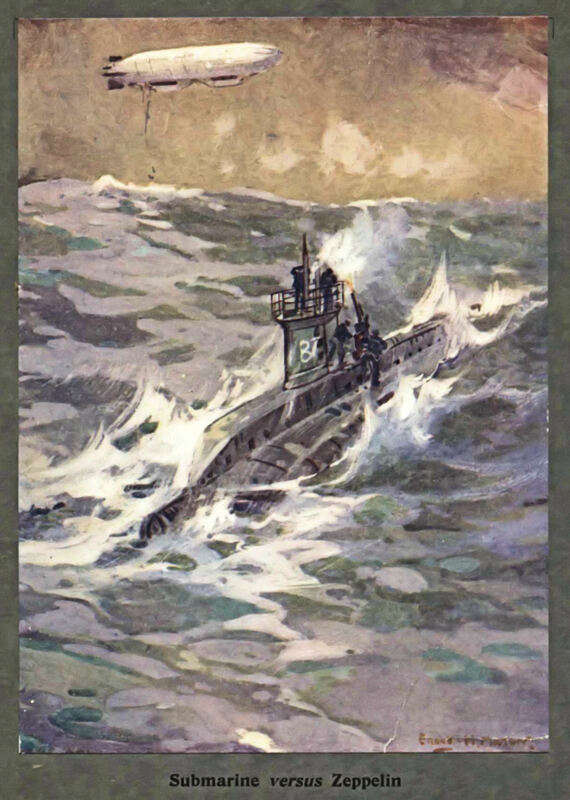 The format for each chapter begins with a "Backstory," a quick history of naval development for each country up to the Great War. This includes the nation's naval mission, construction philosophy, and potential enemies. Next is "Organization," which includes command, but also logistical information and personnel. The third section of each chapter describes the subject nation's "Way of War." This is the real "meat" of each chapter, making the next section "Wartime Experience and Evolution" almost anticlimactic. The chapters are then wrapped up with a "Summary and Assessments." 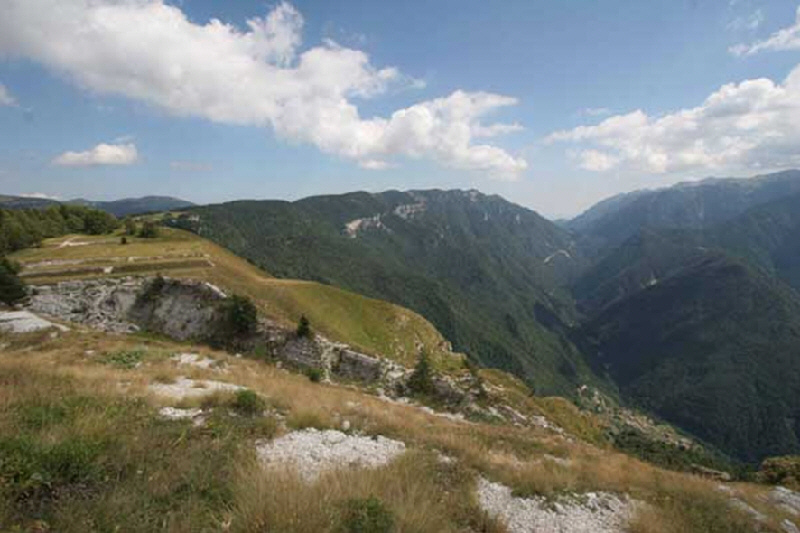 Throughout all the chapters are plenty of charts, maps, and photographs. All the chapters are well done, and this organization makes the material easily accessible. To Crown the Waves is not perfect, however. In the chapter on the United States, for example, twice there is reference to "Texas class" battleships. USS Texas, BB35, and her sister ship New York, BB34, were actually New York class. Mistakes such as this are rare and are ultimately of little consequence to the greater value of the book. 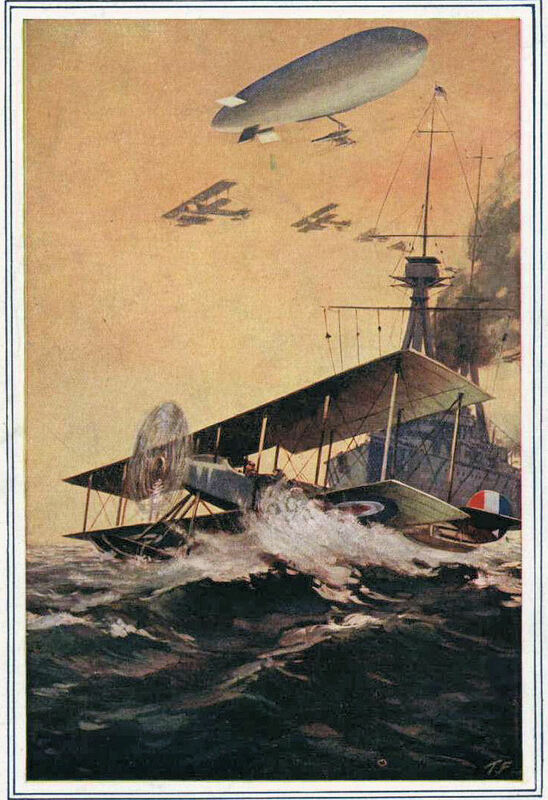 In fact, To Crown the Waves is an excellent, well-researched and thorough study of the world's navies as they collided in World War One. 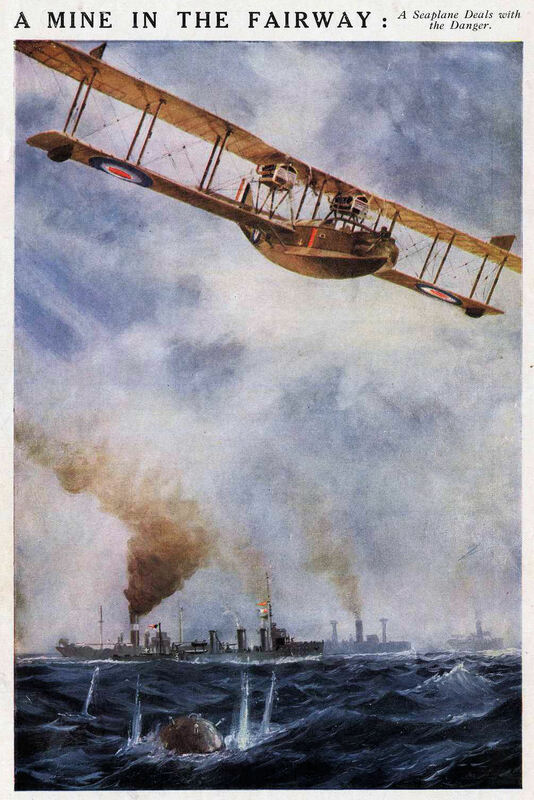 Does it prove the contention that it was the fight at sea that brought victory and defeat in the war rather than those final offensives of 1918? That is left to the reader to decide. 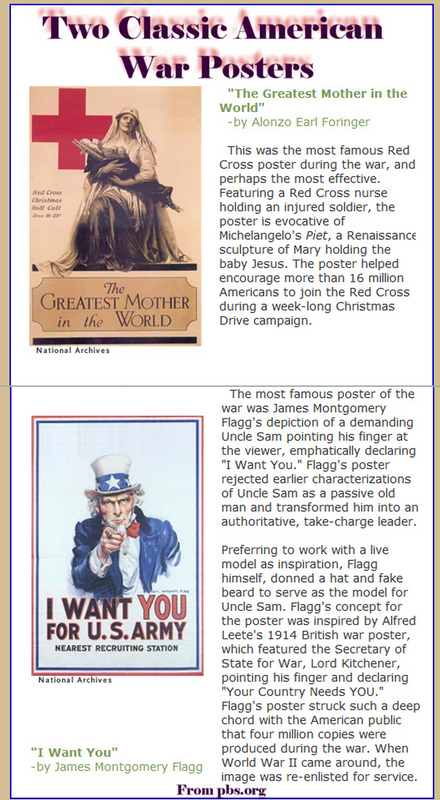 The celebrity culture apparently was alive and well during the Great War if this selection from the collection of regularly contributor Cyril Mazansky is any indication. 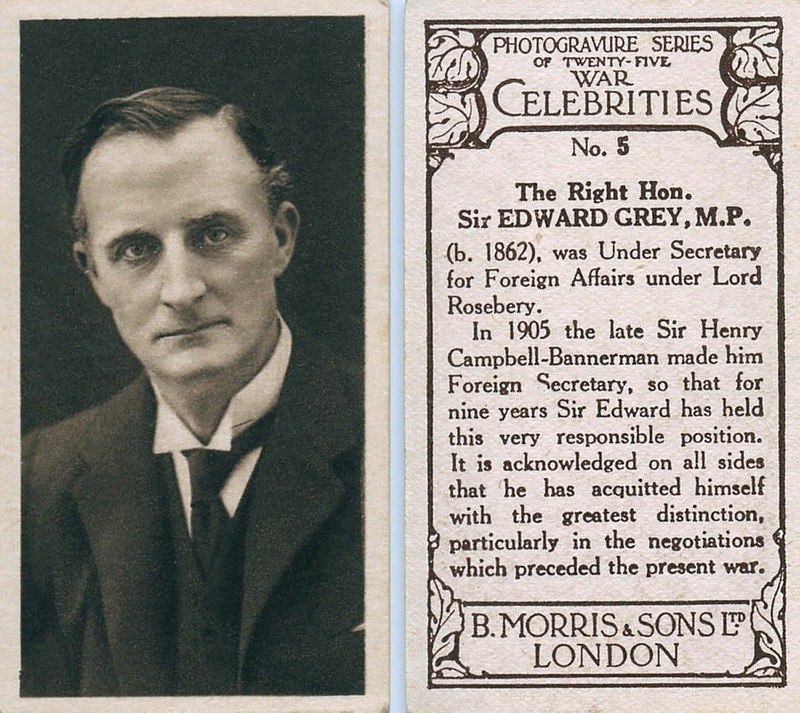 Just as today, celebrities of the day were used to help sell things. Today big contracts are involved, but I have a feeling that none of the parties shown below received big endorsement contracts for helping to sell cigarettes. 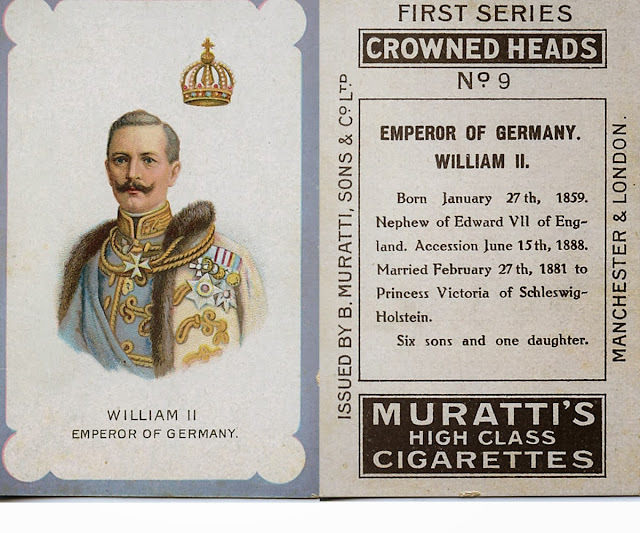 Some these images are excellent depictions of their subject, but in other cases—see Kaiser Wilhelm below—you have to wonder if the illustrator had ever seen a photo of the individual. On 15 May 2006, President George W. Bush announced the initiation of “Operation Jump Start,” a plan to use National Guard troops to assist the Border Patrol in restoring order to the region. When Operation Jump Start concluded in July 2008, over 30,000 Army and Air Guard personnel in all 54 states and territories had served on the border. The National Guard had also been deployed to the Mexican border 90 years earlier, and many units repeated the experiences of their predecessors. Here is the story of one of those units. In 1916, as the United States watched World War I unfold in Europe, General John J. Pershing led an expeditionary force against Pancho Villa. Light Battery A, Rhode Island Field Artillery, was called into federal service 19 June 1916 for duty with General Pershing during the Mexican border conflict. Members of the same unit would repeat history in August of 2006, when they were again deployed to the Mexican border, as part of "Operation Jump Start." 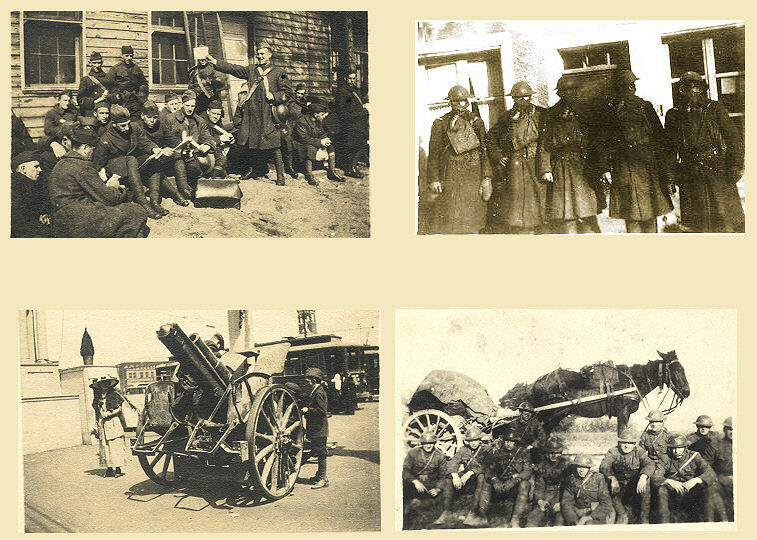 In 1918 the Rhode Islanders also saw action during WWI with the American Expeditionary Force re-designated as the 1st Battalion, 103rd Field Artillery, an element of the 26th "Yankee" Division. 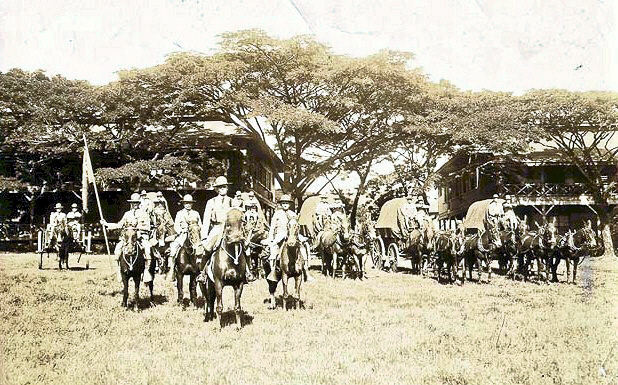 History records that only one regiment of the National Guard, the 2nd Massachusetts Infantry, actually entered Mexico with Pershing's Expedition. The Rhode Islanders along with the bulk of the National Guard troops would not cross the border into Mexico but were used mainly as a show of force. But be that as it may, as you have previously read, activities on the border were far from dull. The troops were on constant alert as border raids were still an occasional nuisance. 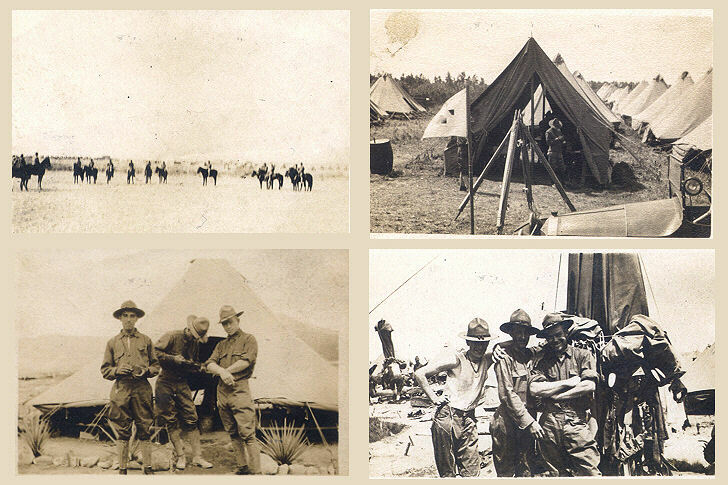 As it later proved, the expedition was an excellent training environment for the officers and men of the National Guard, who were recalled to federal service later on in 1917 for duty in World War I. Many National Guard leaders in both World Wars traced their first federal service to the Mexican Expedition. Military deployments are not always as simple as they are presented by Hollywood and those who have never been deployed. A deployment is hard work with little appreciation. A deployment to the desert can be both dangerous and strenuous. Only someone who has faced this type of danger truly understands the meaning of the word “deployment.” Remaining in the rear with the gear does not qualify even one iota. The troopers of the 103rd Field Artillery experienced this type of danger in 1916 and later on in 2006. Here are some of the situations they endured while in Mexico. Not everyone is wounded or killed in battle. Sometimes the daily rigors of life in the desert can also take their toll on soldiers. The unit left Quonset Point on 9 June 2016 and had a very rapid trip to the border. 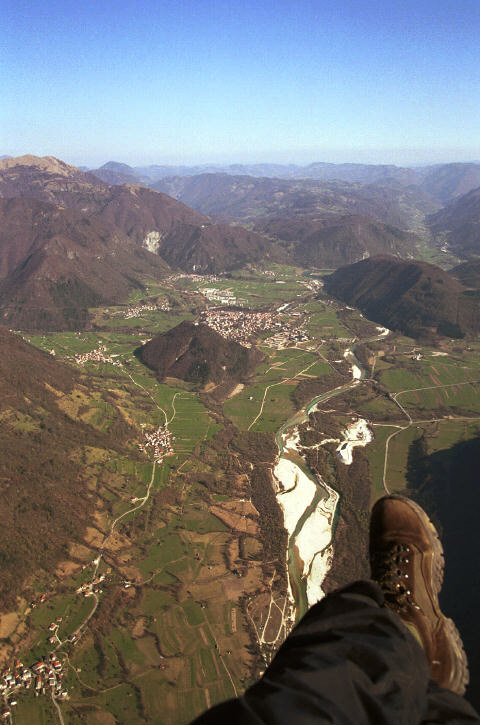 The trip took only four days in all. While deploying to the border, they experienced firsthand how unprepared the nation was for transporting troops to their designated positions. They were among the many units heading to the border, by train, who did not receive proper berthing accommodations until reaching Kansas City. The railroads seemed to lack even the proper number of trains necessary to move thousands of troops from one section of the country to the other. They even encountered delays upon arriving in El Paso. They had to wait hours before vehicles arrived to shuttle them to Fort Bliss. The 103rd arrived at Fort Bliss after midnight and did not unload their gear until the following day. They were assigned to an area known as “Morningside Heights” and were greeted by fifty-seven varieties of cactus, snakes, lizards, scorpions, tarantulas, and hot burning sand. A large ravine ran right through the middle of the camp which was later to be found out became a raging river whenever it rained hard for more than fifteen minutes. 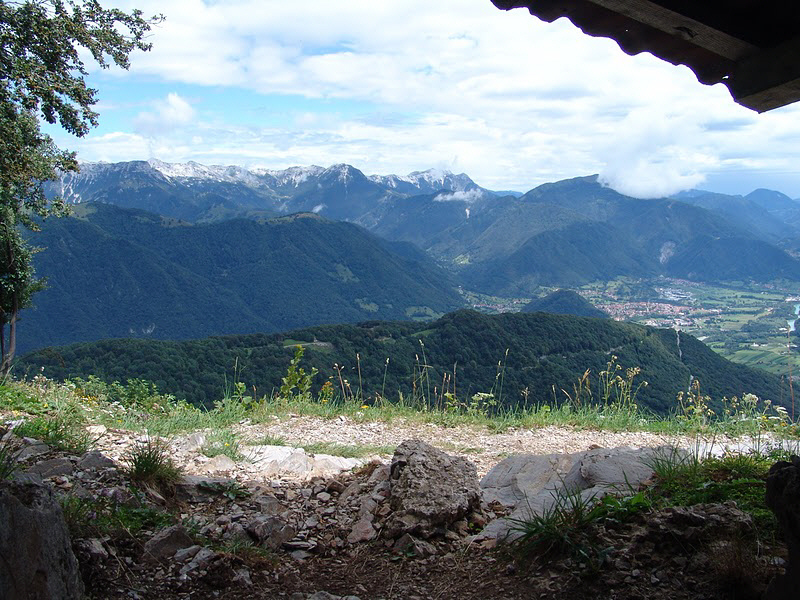 As it rained about four or five times a day needless to say the area was not suited to an artillery unit. So they set up camp in this wasteland and with temperatures of over 120 degrees went to work with shovels, picks, and axes to set up a suitable camp. It took them over ten days to actually become acclimated to the heat and drinking water was always in high demand. 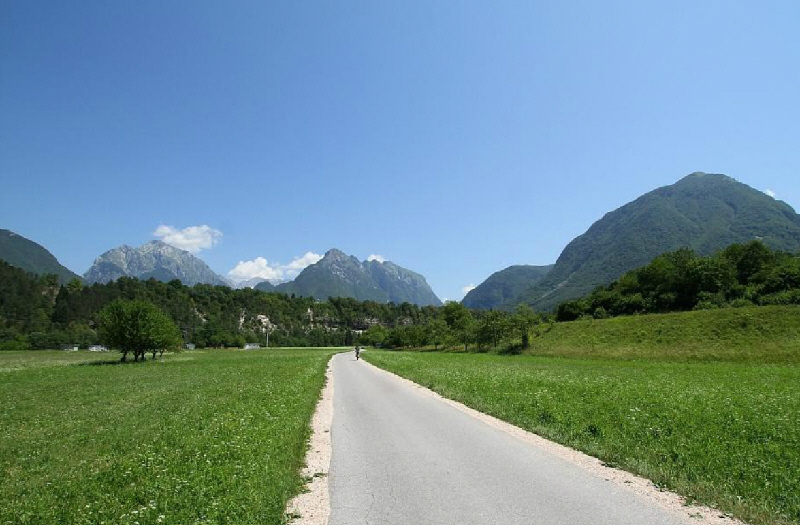 After much hard work the camp was finished only to be told by a camp inspector that they had been assigned to this area incorrectly and were ordered to move to another location. They were moved twice more after clearing land and making it habitable for living. All of this sounds very familiar to anyone who has been involved in a military deployment. Hurry up and wait or hurry up and move. I imagine that in many ways this keeps a soldier on his toes and never gives them any time to become complacent or bored. One of the biggest problems facing the troops in El Paso was receiving the supplies they needed. Many of the outfits stationed there were poorly equipped when they arrived and were in the same state of disrepair when they left three months later. Much of the equipment that was furnished was old and antiquated. The 103rd had to wait six weeks for cots for the men to sleep on. Before that many of them slept on the ground. As the 103rd was equipped with their own cooks, their meals were not as bad as some other units, but still lacked in quantity and taste. One of the daily missions for the troops was breaking in “green” mules. The key to surviving this type of training was to avoid their hooves. Many a trooper discovered to their chagrin that a mule kicks with his front and rear hooves. The unit had over 68 mules attached to it so everyone was given a chance to prove their prowess and stamina with these four-legged troopers. Another hazard to the troops was sandstorms, some of which could be compared to miniature cyclones. These weather events would come whirling through the camp taking up to whatever came in their way from clothes to tents. Hats would disappear never to be found again. These miniature cyclones were coming at such a constant rate that the men began setting up betting pools on when they would strike. The general health of the men was good and on the whole most came back in better health than they arrived with. There were serious — and one fatal — accident from kicks by mules and falls from bucking horses. The days were spent waking to reveille, then mess call, cleaning out the stables and then feeding and watering the horses and cleaning equipment. They drilled with their horses, practicing leg signals and various riding movements including hurdling obstacles. By November of 1916, the Rhode Island unit returned home, but not for long. They were called back into federal service on 25 July 1917. The unit was then drafted into the U.S. Army on 5 August 1917. 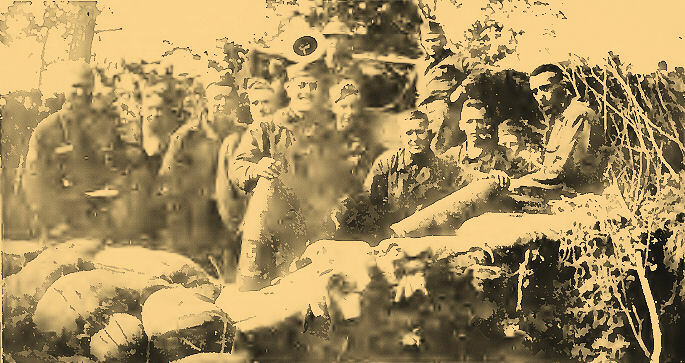 The unit was stationed at Camp Curtis Guild, Boxford, Massachusetts, where it was assigned to the new 103rd Field Artillery, 26th Division, AEF. They were deployed to France, where they served with distinction during the Second Battle of the Marne and the St. Mihiel and Meuse-Argonne Offensives. 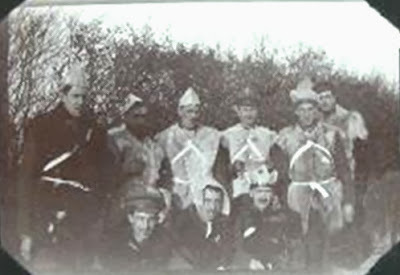 The unit was demobilized at Camp Devens, Massachusetts, 29 April 1919. This month's contributor, Dr. Emily Mayhew of Imperial College, London, is an expert on the medical treatment that the British Army soldiers of the Great War received. Her newest work on the subject, Wounded: From Battlefield to Blighty, 1914-1918, is being released this month by Bodley Head. 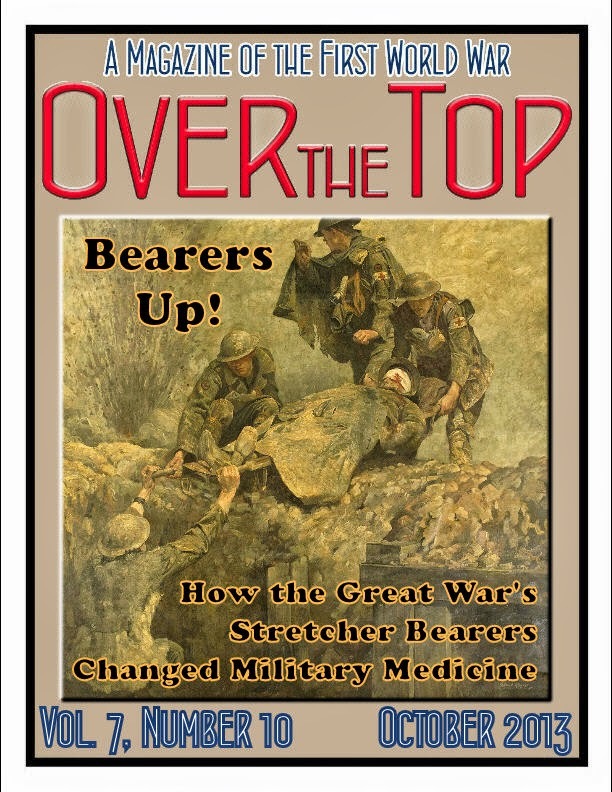 I am proud to be presenting her article on stretcher bearers for two reasons. First, those brave and dedicated individuals began—out of necessity — a revolution in military medicine. The results: today's combat medics with modern facilities, are shown in the slide image below from one Dr. Mayhew's presentations. As "first responders" the World War I stretcher bearer had to initiate the care of men who had often been terribly mutilated by the new weapons of the industrial age, while under fire themselves. Then, still exposed, they had to evacuate their wounded from moonscape-like battlefields. It is this last point that makes me feel additionally proud to be presenting Dr. Mayhew's article. I am a graduate of the U.S. Air Force stretcher carrier's training course. Passing the obstacle course as a member of a stretcher team was the most physically demanding thing I did in my service time. Carrying that stretcher with a man aboard over a rope bridge above a creek, under and over barbed wire and many other obstacles, up and down the hills of Texas — all while the sergeants were gleefully throwing practice grenades at our feet and shaking that rope bridge – was the closest I ever came to the trench warfare experience. I did not realize that until I read Emily Mayhew's article. Each issue of Over the Top includes a main article, full-color images and photos, plus extra features in our "In Parenthesis" section. For our October issue we have included a poem by Robert Service ("Shooting of Dan McGrew"), who made his way to the Western Front as a Red Cross ambulance driver. During his service he continued to write poems, which were gathered in the volume, titled Rhymes of a Red Cross Man from which this work, "The Stretcher-Bearer," was selected. He dedicated the collection to his brother, Lt. Albert Service, who was killed in Flanders in August 1916. It is my Royal and Imperial Command that you exterminate first the treacherous English, and walk over General French's contemptible little Army. It is not true that Germany is guilty in having brought about the war. . . It is not true that we wantonly violated Belgian neutrality. . . 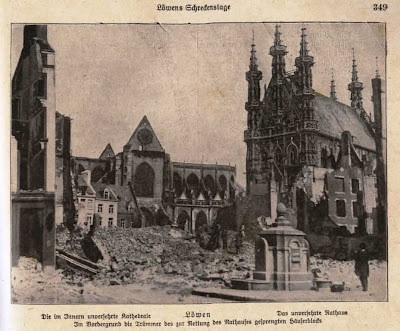 It is not true that the life or property of a single Belgian citizen has been infringed by our soldiers, except where such an attack was dictated by the bitter necessity of self defense. . . It is not true that our soldiers have brutally devastated Louvain. . .
Woe upon you German dogs! Winston [Churchill] like every genius (and he really is a genius!) will not brook criticism and idolizes power and so has surrounded himself with 3rd class sycophants—I have told him this to his face! It is the women of Europe who pay the price while war rages, and it will be the women who will pay again when war has run its bloody course and Europe sinks down into the slough of poverty like a harried beast too spent to wage the fight. It will be the son-less mothers who will bend their shoulders to the plough and wield in age-palsied hands the reap hook. Our life is running at full speed. Everyone is occupied by the war, with care for wounded and the arrangements for future Polish refugees. The mood is wonderful, with a total belief in success and in victory. We are going on a 4 days train journey, probably to Belgium. I am tremendously excited. 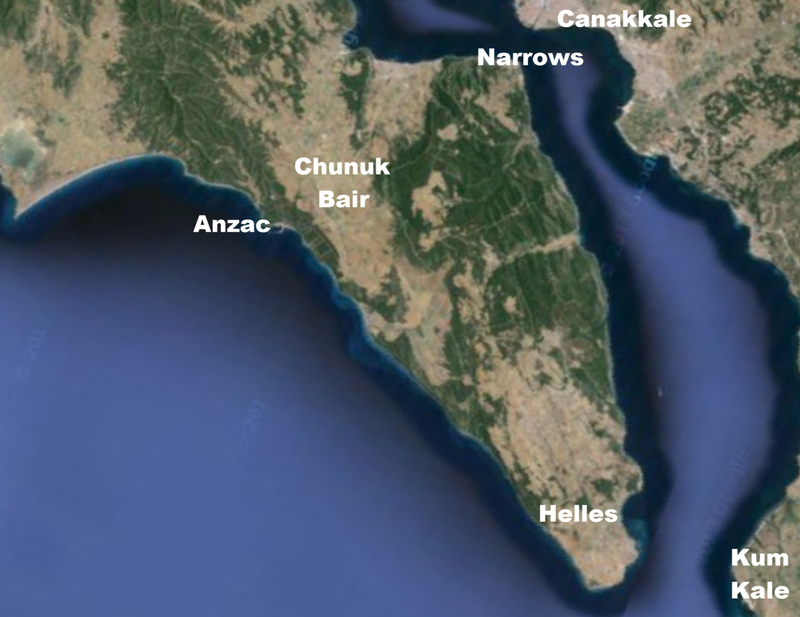 Swimming in a sea of military defeats, the Ottoman leadership, it seems, should have opted for less war, not more, in 1914. The generation at the helm of the state, however, welcomed the July Crisis not as a reprieve but as an opportunity to end the empire’s international isolation. I have no more reserves. The only men I have left are the sentries at my gates. I will take them where the line is broken, and the last of the English will die fighting. 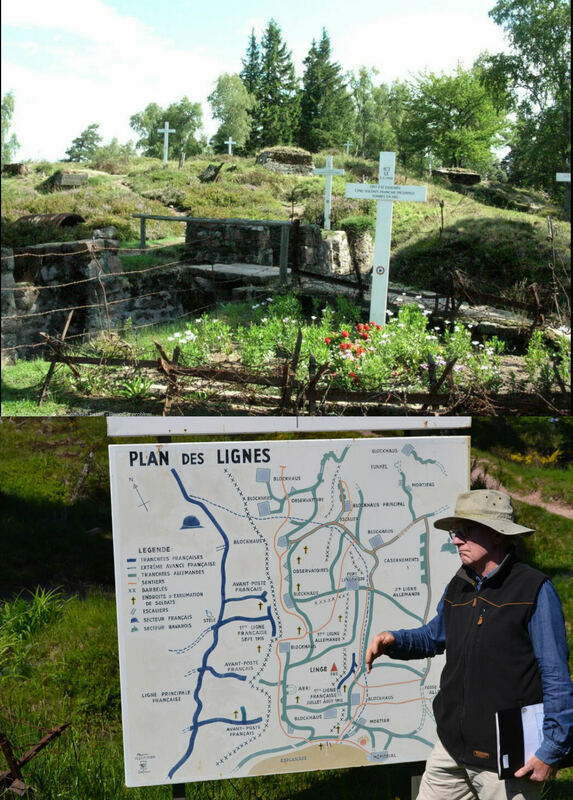 The struggle for Le Linge, a hilltop located fourteen miles west of Colmar in the Vosges Mountains, was one of the bloodiest battles of the First World War, but is mostly forgotten today. Between 20 July and 15 October 1915, the Germans organised their defense here in order to prevent French troops advancing on Colmar. 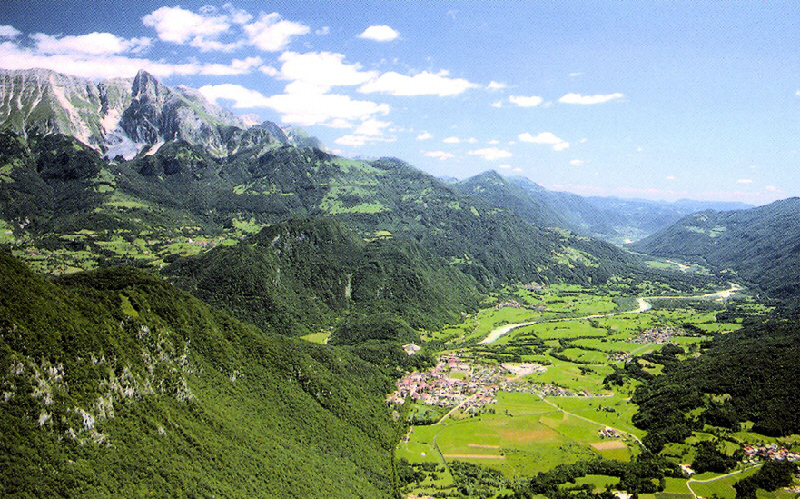 In 1915 this area was part of the Alsace, which Germany considered its own. The fighting was extremely violent, with 17,000 killed counting both the French and German losses. Gas and flamethrowers were used here. 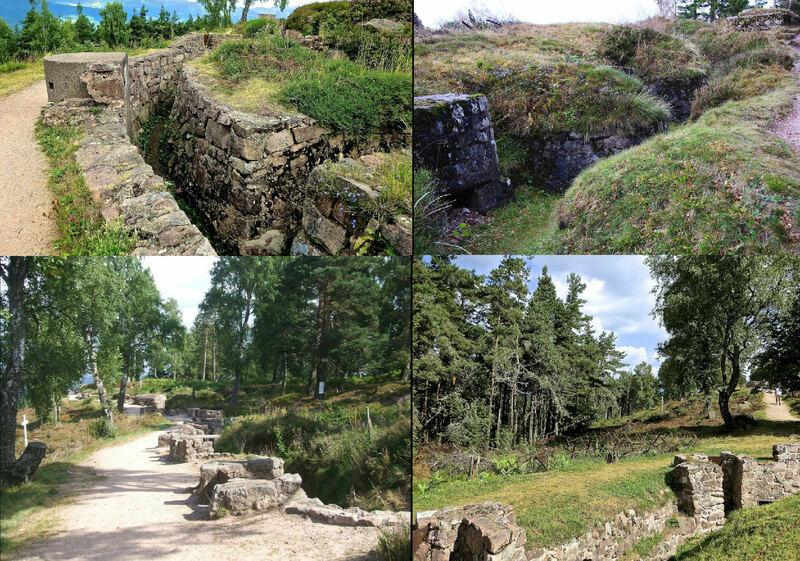 Subsequently, as both sides came to realize that a major breakthrough in the Vosges was unfeasible, the hill was the site of some of the closest, most intense trench fighting of the Great War. 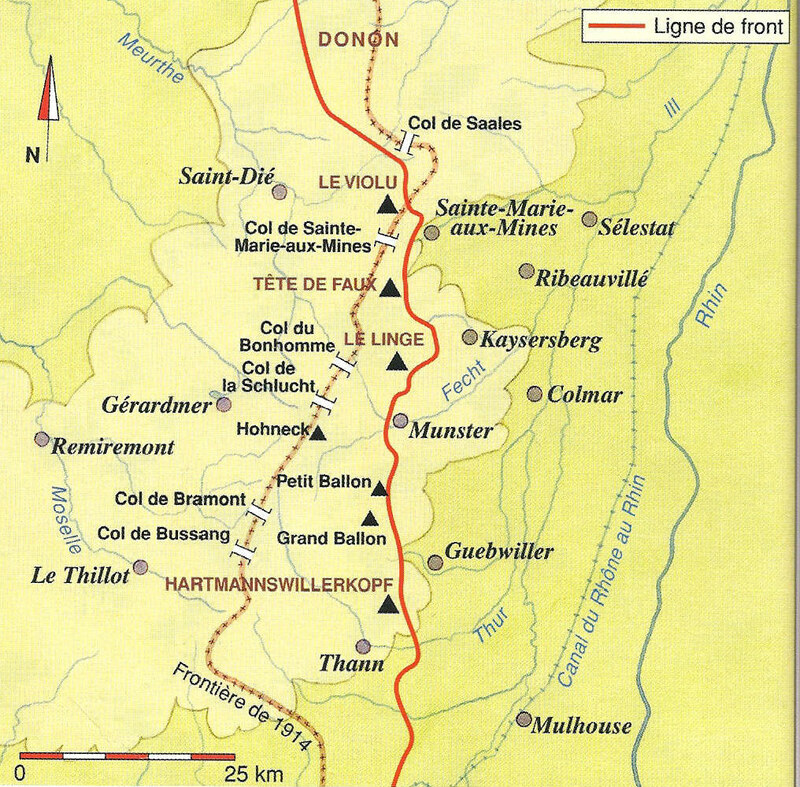 The area shown here between the 1914 border and the line of 1915-1918 was the only German territory occupied by the French Army before the Armistice. Rites of Spring is about death and destruction, rupture, disorder, and crisis — some of the most important features of the modernist period. Eksteins argues that it was the Great War that was the psychological turning point for modernism; after 1918, he claims, "The urge to create and the urge to destroy had changed places." Eksteins focuses on the emergence of our modern consciousness in the first half of the twentieth century — and more specifically, on our obsession with social, artistic, and sexual emancipation. The title of Eksteins's study comes from Stravinsky's ballet, a landmark of modernism. The main motif of the ballet is movement. By movement, Eksteins means the dance of death as a result of our acquisition of the power of ultimate destruction. In our pursuit of life and emancipation, he argues, we have killed off millions of our best human beings. Rites of Spring is a cultural history that incorporates not only music, ballet, and other arts but also manners and morals, customs, and values. In this respect, it is similar to Samuel Hynes's A War Imagined: The First World War and English Culture (1991); unlike Hynes, however, Eksteins focuses on the avant-garde and modernism, claiming that the latter is "the principal urge of our time". For Eksteins, the state of human consciousness after the war is best traced in the lives and words of ordinary people. These demonstrate a profound spiritual crisis, which affects rural laborers, large landowners, industrialists, factory workers, shop clerks, and urban intellectuals alike. Economic and social insecurity underlined and intensified a crisis of values brought about by the war and its aftermath, particularly the peace that failed to meet the expectations promised by leaders during the war. Eksteins quotes Paul Valéry in a lecture in Zurich in 1922: "and still we are restless, uneasy, as if the storm were about to break. Almost all the affairs of men remain in a terrible uncertainty." Valéry was alluding to all that had been injured by the war: economic relations, international affairs, and individual lives. Above all, it was the human mind, he argued, that had been most severely wounded. Eksteins supports this claim. While some historians such as Professors Robert Wohl and Jay Winter have criticized Eksteins for making "outrageous statements" (Jay Winter (ed. ), The Legacy of the Great War Ninety Years On, 2009), the same historians have also described Rites of Spring as "exciting, very exhilarating to read, and very provocative." Rites of Spring is indeed a daring project, which brings together the avant-garde, modernism, and the social, political, and artistic agents of revolt in the aftermath of the war. Eksteins promises (and delivers) an "historical account [that] proceeds in the form of a drama, with acts and scenes, in the full and diverse sense of these words. In the beginning was the event. Only later came consequence." Rites of Spring is original, witty, and perceptive. Written in clear and easy-to-read prose, it is also a solid scholarly work, copiously annotated, and packed with references, artistic, political, and social. There is indeed something for everyone who is interested in how the war changed forever our view of life and history as well as how it radically altered the psychology of Europe. Rites of Spring is a book that should not be missed!